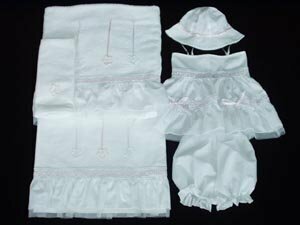 This six-piece towel and lathopana set contains a bath towel, hand towel, sheet and three-piece undergarment set. 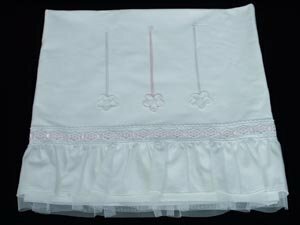 The bath towel and sheet are decorated with three cute pink and white daisies with flowing satin stems. 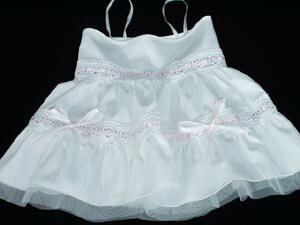 Also, a fancy pink lace trim highlights their wide ruffled edges. The girl�s camisole top is decorated with the same pretty trim and satin bows. The tulle edge at the hem of the camisole, sheet and bath towel is an extra detail, which shows how special this design is.